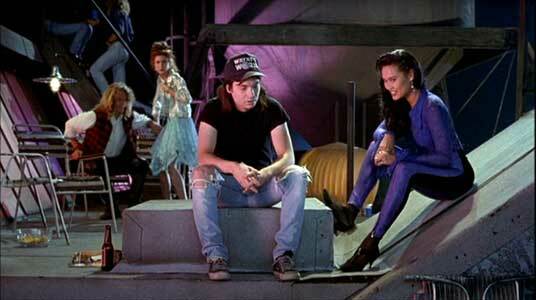 Mike Myers and Dana Carvey wear black high top Converse “Chuck Taylor” All Stars in the film. 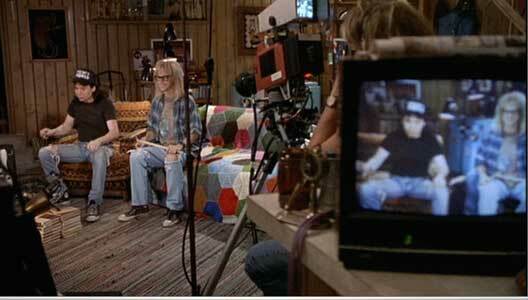 Wayne’s World is broadcast from the basement in Wayne’s house. Wayne falls in love with Cassandra, the lead singer in a local band. The plot of Wayne’s World is very predictable and is really just a shell upon which the humor and special dialogue of Wayne and his friends is placed. A slick Chicago ad executive, Benjamin Oliver (Rob Lowe) accidentally watches their television show, which is an underground hit in the Aurora area, and sees it as the ideal vehicle for a client (Brian Doyle-Murray) who owns a chain of video game arcades in the Chicago area. Benjamin decides to buy the show and make it more commercial, and persuades Wayne and Garth, who are at first reluctant to sell out, to sign over the rights to their show to him by offering them each cashier’s checks for $5,000. Meanwhile Wayne falls in love with Cassandra (Tia Carrere), a beautiful Chinese girl who is the lead singer in a local heavy metal band. When Benjamin and Wayne have a falling out over the commercialization of the Wayne’s World show, Wayne is fired from the show. Additionally, when Benjamin sees Cassandra, he tries to win her away from Wayne by offering her a music video contract. This all leads to a final confrontation between Wayne, his friends, and Benjamin. Garth and Wayne watch the planes take off at O’Hare International Airport. The thing that makes this film enjoyable is the self-deprecating humor and the commentary on today’s society that we get throughout the film. Michael Meyers, who co-wrote the script with Bonnie Turner, was smart enough to realize that for this film to work, it couldn’t take itself seriously in any way. This is accomplished through numerous asides to the camera by both Wayne and Garth, some unusually conceived scenes like when they are back stage with Alice Cooper discussing the history of the town of Milwaukee, and by paying homage to their media roots by acting out scenes from the Laverne and Shirley show at a brewery. The visual shots of the Chicago area are well done, and there are humorous in-jokes that people who grew up in or know the area will appreciate. There are some hilarious musical numbers, also. 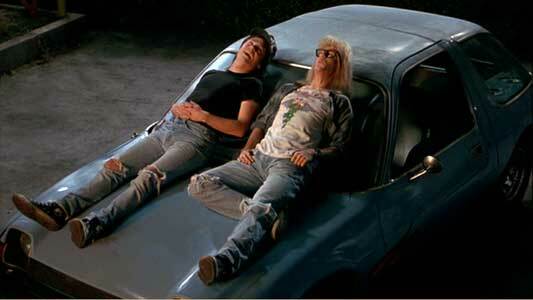 One of the best is when Wayne, Garth, and their three crew members are driving down the streets of Aurora singing “Bohemian Rhapsody”, and another occurs when Garth fantasizes about the woman of his dreams, lip-synching to “Foxy Lady” by Jimi Hendrix and undulating toward her with serpent-like pelvic thrusts. There are some good original songs performed by Cassandra and her band, although they sound much more cleaned up and in tune than the typical metal band. Another great musical joke in the film is whenever Cassandra’s band plays, Wayne goes into a dream-like state while Gary Wright’s “Dream Weaver” plays in the background. Even though the material is thin, there are enough laughs and pleasurable moments to keep you interested. 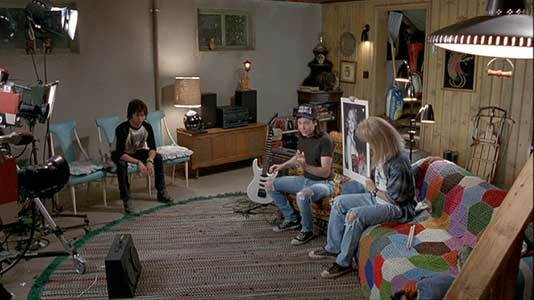 Wayne and Garth discuss entries in the “excellent babe” contest. 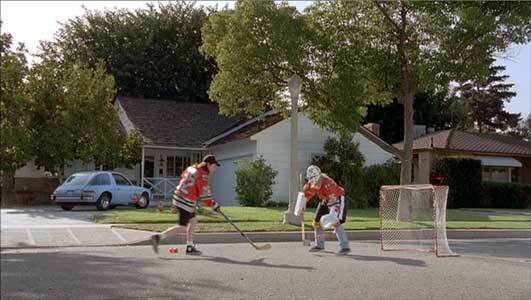 Wayne and Garth playing street hockey in their chucks. 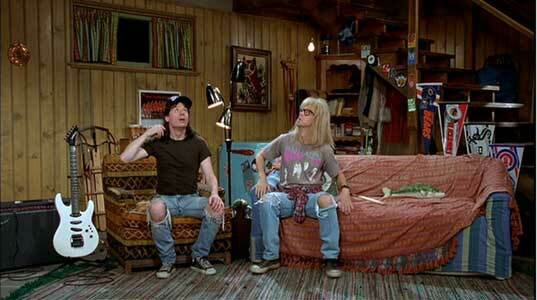 Both Wayne and Garth proudly wear their black chucks high tops throughout the entire film. Chucks are a basic part of their standard metal scene attire which includes long hair, torn Levis, and dark t-shirts. The best chucks scene has to be the street hockey game they play in full Chicago Blackhawks uniforms plus their chucks. Each time they run a play, a vehicle comes along and they have to move the goal off to the side of the street. Wayne is amazed at the broadcasting network’s version of his basement. Wayne’s World. (1992) Michael Meyers, Dana Carvey, Rob Lowe, Tia Carrera, Brian Doyle-Murray, Lara Flynn Boyle, Kurt Fuller, Colleen Camp, Donna Dixon, Meat Loaf. Directed by Penelope Spheeris. Categories: Comedy, Teenagers.